Trifiniti is proud of the accomplishments of all our athletes from novice to elites. The dedication and commitment that’s required to train for and complete an endurance event is enormous. Below is just a sample of the athletes who have achieved their goals along the way to enhancing their lives through training and participating in endurance events. Kathy Winkler – Trifiniti athlete since 2001 with 22 wins…and counting. 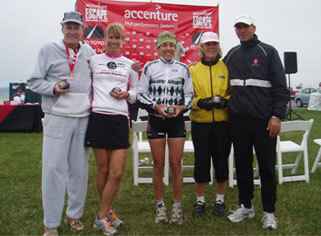 The Winkler girls, Kathy, Jo Jo and Mattie sweep their respective age groups at the 2007 Escape from Alcatraz Triathlon (left). Kathy runs from behind to win the women’s 35-39 age group at the Ironman World Championship in Kona, Hawaii (right). Kathy Winkler - Trifiniti athlete since 2001 with 29 wins...and counting. Kathy's accomplishments since starting with Trifiniti in May 2001 is nothing short of phenomenal. Her strive for perfection and competitive spirit has enabled her to become one of the most accomplished age group triathletes in the history of the sport. As a single mother of two and school teacher, Kathy has mastered the art of juggling life's responsibilities with her love for athletics. She is a two time Hawaii Ironman World Championship age group winner, 2005 Vineman 70.3 overall women's champion and finished second place overall woman in her first multi-day stage race, the 2009 Ultraman World Championship in Hawaii. She continues to excel at all distances from Olympic to Ironman to Ultra. Kathy was undefeated in 2009 winning her age group in every competition she entered. Inside Triathlon featured her accomplishments in a recent full length article written by Susan Grant. 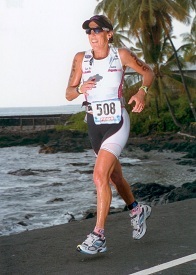 Jeri Howland – Trifiniti athlete since 2000 with 28 age group wins and an Ironman world record. I have Jeri to thank for re-sparking my interest in coaching. She approached me in the late 90’s to ask if I could help her break through a plateau that she had found herself caught at. Jeri had more than 30 years of experience competing in endurance sports. Since coaching wasn't my full time occupation at that time, I wasn’t sure if my busy work schedule and own training would provide me with enough time to devote to coaching. However I really believed in Jeri and admired her passion for the sport. In a few short months, Jeri found herself back on the podium in a number of big races such as Ironman Canada and the ITU Long Course World Championships. Jeri continued to race well to the point where she routinely turned down coveted Ironman Kona slots. Among her most acclaimed victories is her age group win at the 2002 Ironman Austria in time of 10:41 where she won her age division by nearly an hour. Achieved at age 46, this spectacular time was celebrated as a world’s fastest ever for any Ironman distance event for the women’s 45-49 age group. It held for more than a year. Jeri continues to show us all that we are only as old as we race. Jeri doesn’t plan to slow down anytime soon as demonstrated in her new PR for half IM distance that she set last year at age 50. 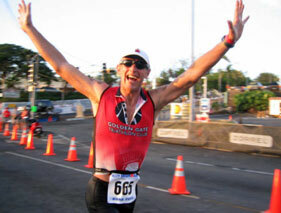 I first met Grant in 2003 as a member of the Golden Gate Triathlon Club. He had recently taken up triathlon to justify his passion for running and exercise following a sedentary lay off that resulted in considerable weight gain. Although his San Francisco advertising agency was booming Grant realized that he needed to regain control of his body in order to stay focused on work and set an example for his two teenage sons. Grant had attended recent lectures I offered to the club and decided he would give Trifiniti a try. It was during our first meeting that Grant excitedly exclaimed that his goal was to qualify for the Ironman World Championship in Kona. I recall being surprised at this declaration because as I had not seen the type of talent required for such a lofty ambition. I was surprised a few months later when he cleaned my clock at a local half Ironman event. He collected his Kona slot one year later at Ironman Brazil. That was the last time I found myself surprised as I have come to appreciate his hard work and dedication for training and racing. His transformation into an 8-time Ironman finisher and Kona qualifier continues to evolve. I have no doubt that he will be a regular at the Kona starting line for years to come. Grant is also credited as the designer of the Trifiniti logo. Thanks Grant! In only his first full season and at age 24, Nate has already shown he deserves to be on the leader board. 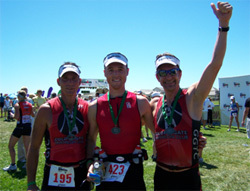 Nate joined the 2007 group training program to help prepare him for his first Ironman of his young career. Based on his only half IM at the 2006 Napa Vintage Half Iron event we estimated that he had the potential to do the full distance in approximately 10:30 and would be a contender for a Kona slot. We were spot on this prediction as he completed Ironman Coeur d’Alene in 10:32, finishing 8th place in his division. With just one season under his race belt, this young lad has a bright future in the sport. I met Tom in 2005 at the San Francisco Bay Club when he asked for help with some exercise equipment. I asked Tom if there was a specific sport or hobby that he wanted to train for. He said that he wasn’t training for a particular sport but proudly announced that he had been a “pretty good” triathlete in his younger years. As it turned out, Tom had not competed for more than 20 years. He was also one of the original contributing writers for Triathlete Magazine back when the sports only tabloid was first published in the early 80’s. Among his contributions was his 1984 article "Iron Curtain Man", a spoof which drew an official denunciation from the USSR Sports Federation. Tom had been completely removed from the sport to focus on his law career and was now a journalist and published author. He seemed to me to be looking for a new challenge with his 70th birthday only days away. So I casually suggested that he consider returning to the sport. Tom visited me a week later excited about his decision that he would give Triathlon another try. Tom’s competitive nature quickly set his sights on becoming a top age group contender. It took a few months to bring Tom back to speed physically as and to educate him regarding all the new developments within the sport. When it came to triathlon, it is as if Tom had gone to sleep for 20 years then awoke to discover his brand new passion for the sport. Welcome back Rip, I mean, Tom. As you can see from his results he has held true to his goal of being among the top in his age group. While it may be true that a picture says a thousand words, Mark's amazing before and after photos only scratch the surface of a story that continues to inspires us all. Mark was a successful and overworked accountant who was nearly 200 pounds overweight and faced life threatening health problems -- if he didn't turn things around fast. He quickly educated himself on proper nutrition and exercise then patiently whittled his body down by an astounding 180 pounds. This process took four years but Mark was determined to keep the weight off and avoid the weight loss industry's "lose weight fast" schemes. He became certified by the American College of Sports Medicine then found himself in a new career as a personal trainer. I hired Mark at the San Francisco Bay Club so that he could realize his dream of helping others overcome obesity and stay healthy. It was about that same time that I encouraged him to take up triathlon to help maintain his own fitness. The media also found Mark's story fascinating resulting in several magazine articles and television appearances. Mark was featured in the 2001 Escape from Alcatraz television coverage. Mark has now completed over 30 triathlons and is a 4-time Ironman finisher. He has committed to the sport for many years to come and writes about it for Examiner.com (www.examiner.com/x-7447-SF-Extreme-Training-Examiner) and for Lance Armstrong's Livestrong.com. 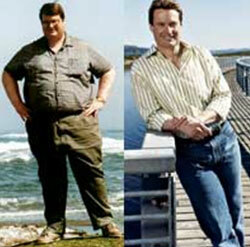 You can read more about Mark and his journey from "Fat Man to Ironman" at www.xbigman.com. 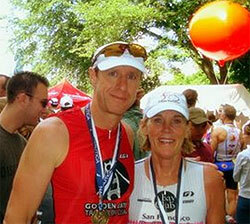 Mark and Sunny McKee – Trifiniti athletes since 2007 prove that couples who train together remain together. It would be difficult to find a more pleasant couple that Mark and Sunny McKee. Both have been involved in the multi-sport lifestyle for many years. If the sport had a husband-wife division you would be sure to find them at the top. Their affection for each other and athletics can be witnessed on any weekend day in the Bay Area. I doubt there’s a husband-wife team who has escaped from Alcatraz more times than this tri-couple. While Sunny has a long history of regular appearances on the podium, Mark is quickly moving up to join her. And the way he’s improving it looks like they’ll be spending some time together on the top step. I’ve known the McKees for a few years and was honored when they asked me to work with them this year. I have a standing joke with my athletes who race in my age group. I tell them that if they beat me in an event I will raise their coaching fees. It hasn’t discouraged anybody so far, and I can’t say that I’ve lived up to my threat to raise fees. One athlete who qualifies for this price increase is Geoff Farrell, whom I known for many years as a fellow member of the Golden Gate Triathlon Club. Geoff was part of our 2005 Trifiniti Ironman training group. I always felt that Geoff had more talent than his race results indicated but since he was one of my competitors I wasn’t going out of my way to give any training tips. That was until he hired me as his coach last year. Geoff’s made some breakthroughs this year and it looks he may very well be on his way to his first USAT All American ranking. If so, I doubt it will be his last time as an All American or a candidate to be threatened with higher coaching fees. 2007 GGTC IM Training Group athletes at the last supper before IM Coeur d’Alene. More than 200 Trifiniti athletes have completed Ironman distance events in the past seven years. Many prepared for the big day with others in one of our successful Ironman group training programs while others endured the rigorous training solo style. Congratulations to the following athletes who completed an Ironman event during this past year.